The 10 Best Steakhouses in Utah! When steak is good, it’s life-changing. That’s why no meat lover should go too long without indulging in a mouthwatering cut of beef. Luckily, Utah has plenty of excellent steakhouses that will send your taste buds straight to heaven. Here are the 10 best! Argentinians are known for their meat, and if you’re looking for a quality steak at a lower price point, Asado Argentinian Grill is a great option. Their steak—called the Milanesa de Carne—is only $16. Make sure you buy some empanadas and their mint pineapple beverage to wash it all down. Certainly on the pricier side, a steak at Spencer’s for Steak and Chops is the perfect meal for a birthday or anniversary celebration. If you’re craving high quality steak, this is the spot. Located at Robert Redford’s beautiful Sundance Mountain Resort, the Tree Room is a gourmet restaurant with an unforgettable rustic feel. Their best menu item? The pepper steak with spinach, buttermilk mashed potatoes, and mango chutney for $44. A classy American bistro, Tiburon Fine Dining’s focus is meat. Although the restaurant has a limited menu, one third of the menu consists of steak. With outdoor dining options, Tiburon is a great place for a seemingly patriotic, summertime steak. Communal Restaurant celebrates the importance of fresh, locally-sourced ingredients. This philosophy reflects on the restaurant’s beloved steak: A locally-sourced, prime flat iron steak with potato-mustard puree, and mustard greens. Offering different steaks at a variety of prices, Anasazi Steakhouse in St. George uses what are called “hot stones” to cook their meet. Essentially, slabs of volcanic rock are heated in a special oven for 6-8 hours before they are delivered to your table with your entrée selection. There, you have ultimate control over the cooking of your meat. Taking a unique approach to steak, the restaurant is a must-do for meat lovers. A Northern Utah classic, Maddox Ranch House serves up traditionally prepared steaks that seem like they would be a lot more expensive than they actually are. 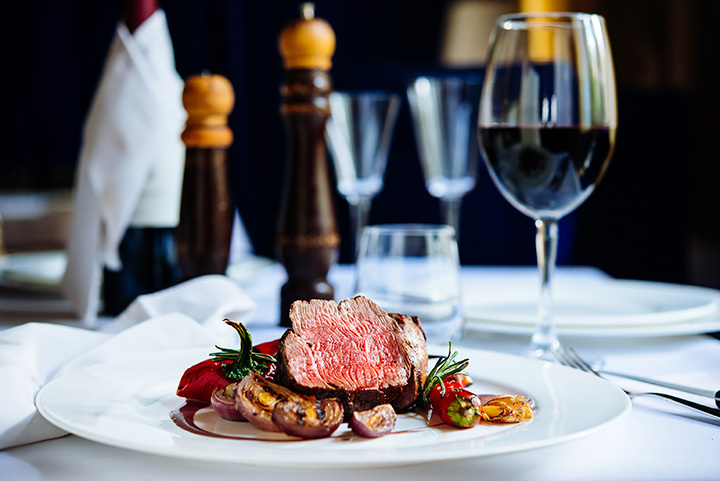 With locally-sourced meat and a long-standing tradition, Maddox Ranch House offers both the taste and ambience you seek when you think of a nice steak dinner. Avenues Proper is a relatively new player on the Utah food scene, but with such good food, it’s going to rise in popularity very quickly. The restaurant dishes up some serious culinary classics from around the globe, but twists them in unexpected ways. Their steak—which is on the menu as “Steak Frites”—packs a serious punch. Cedar City is one of those places you go when you want to get away from it all without actually getting away from any modern conveniences. In accordance with that vibe, Rusty’s Ranch House makes you feel like you’re really at a “Ranch House,” enjoying the freshest, down-home cooking possible. Offering four different steaks from $19 to $27, the restaurant is famous for attracting meat-a-holics from across Utah. While Kimi’s Chop & Oyster House may be best-known for its seafood, the restaurant’s filet mignon and spice rubbed ribeye “steak frites” are equally memorable. While its on the pricier side, Kimi’s is more than worth it.